There’s a fantastic story behind nearly every vineyard and winemaker out there, and La Folia Winery in downtown Murphys, CA, is no different. As the owners say themselves, their wines are a combination of “a delicate balance between the soft nature of sanity and the bold and evolving nature of madness.” Intrigued? Plan to visit their tasting room the next time you stay with us at Hotel Charlotte? Our region is known for its vast natural beauty, outdoor adventure, and the Gold Rush, of course. But, in addition to all of that, you’ll also discover unique shopping and dining experiences, as well a number of delicious wineries, including La Folia Winery, and several more closer to Hotel Charlotte. Download our free Vacation Guide for our suggestions on the best things to do and see in the area. The unique wines and the owners’ quirky sense of humor are worth investigating when you visit the La Folia Winery in Murphys, CA. The establishment is about an hour's drive from Hotel Charlotte, which makes for a lovely afternoon outing. As always, please enjoy wine responsibly. Ryan Teeter experienced his first wine tasting in 2002, an event that changed his life forever. Ryan was inspired by the wine he tasted, as well as the knowledgeable wine experts in his company. He then set out to learn everything he could about winemaking. That included buying a kit and making a trial batch of wine in his apartment! Over time, Ryan began making wine with “real equipment” and from grapes (not a kit). He continued to consult a host of experts and soon aspired to become a professional winemaker. From there, Ryan's educational experiences included working a harvest season at Fogarty Winery, winning the Best in Show Red award from WineMaker Magazine International, and earning a spot as assistant winemaker at Lavender Ridge Vineyard. The challenges and triumphs along the way ultimately led to Ryan launching his label, La Folia Wines. La Folia’s array of wines includes a Zinfandel, Pinot Grigio, the La Folia Masquerade (a Frizzante) and The Madness, a Tuscan-style red blend. There are many more, so be sure to visit the website to browse ahead of your trip. Ryan Teeter’s sense of humor shines through, from the wine names to the tasting room decor to the tasting experience itself. Grab a space at the bar, put on a hat (it’s a must), and experience the La Folia Winery “madness” for yourself. You can find the Tasting Room at 263A Main Street in Downtown Murphys. It’s open Thursdays from 12-5 p.m., Friday – Saturday 11 a.m.-6 p.m., Sunday-Monday 11 a.m.-5 p.m.
Stay with Us at the Hotel Charlotte! After an exciting day of exploring one of the best wineries in California, let yourself unwind by staying in the most luxurious lodging possible! 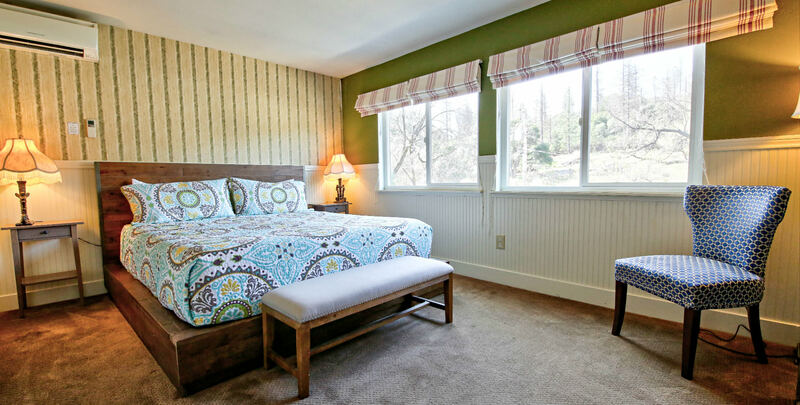 Hotel Charlotte is a historic bed and breakfast in Groveland, CA, that offers comfortable furnishings and excellent amenities within a charming, rustic environment. Choose from one of our 12 lovely rooms or renting one of our cozy vacation cottages. You can then very easily explore the many attractions of our surrounding town of Groveland, adventure through the magnificent Yosemite National Park, or simply spend time unwinding in our relaxing environment. The hotel features an elegant living room, friendly and helpful staff, and even our very own restaurant to accommodate all of your needs! Don’t wait another minute to start planning your dream vacation; check our availability and book your stay today!